I generally am not a fan of "Year in Review" posts or articles, but I felt that this year has been really special for me and this is the space I use to share my thoughts, so here it goes. The thing that stands out to me most in 2013 are my friends. Everything I've done has been, in part, because of the support of my friends. 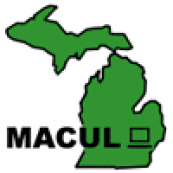 I was recognized in my state as the Tech Teacher of the Year (MACUL) and by ISTE as the Teacher of the Year. These are awards that are still shocking to me because I know so many great educators that are also deserving of recognition. These honors are because I have been lucky enough to surround myself with people that support my crazy ideas and have told me where I need to make changes. Awards are never about success on an individual level. We all get to where we are with a little help from our friends. 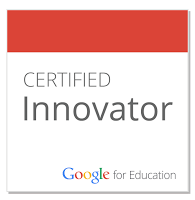 I travelled more than any other year in 2013 working to spread edtech awesomeness to others. Part of that was giving a Keynote with my buddy +Timothy Gwynn. I travelled to San Francisco, Indiana (twice) and many parts in between. I was able to meet so many great educators face to face and learn what they are doing in their classroom and take parts of that and add it to my tool belt. 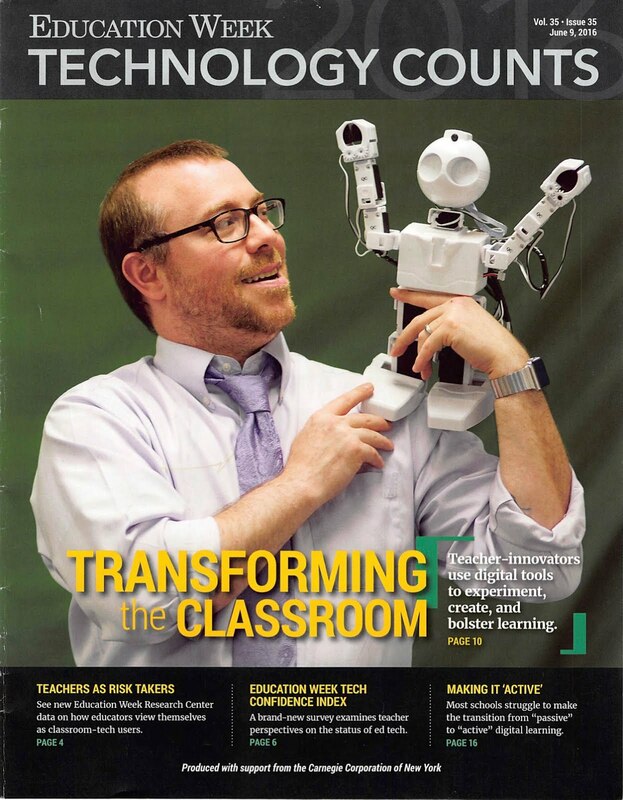 While I was brought it to impart to teachers and admins they things they can do to add tech as part of their classroom lives, I always left with new ideas that got me excited. I also travelled the country on a road trip with +Timothy Gwynn. We drove from Indiana to San Francisco and had some amazing conversations with dedicated educators. Thank you to everyone that came out and shared your thoughts with me. I learned so much about education around the country and know there is so much more to learn. I hope I have a chance to do this type of trip again and share with everyone what I learned. I will be writing a book for Corwin publishing. It will be about Cloud Computing and the different tools out there that allow students and educators to work in the cloud. This is my first book with a publisher and I'm excited/nervous about the process. I know my friends will be there to support me along the way. The #EduBroAwards were another great success and we can't wait to hastily through together the best awards show in education in 2014. The one thing I can promise to bring back for 2014 is #NerdyCast. I was shocked to see #NerdyCast still on lists for top ed podcasts. I haven't done a NerdyCast since December 2012 and the BAM! was just a disaster. As busy as I have been this year, it is the one thing I missed most and it has to do with the fact that I get to talk with friends. #NerdyCast will be something I aim to do once a month and I just need to get Tim on board as my co-host and we will have the best ed show on the interwebs. Tweet him and tell him he needs to do it. I hope everyone has a great and safe New Year's Even and Day. Thanks for all of the support you have given me and my crazy ideas. I hope to keep you entertained for 2014. Lesson for 2013: I'm nothing without the support and love of my friends and family. Thanks Jen, Leo and my PLN. 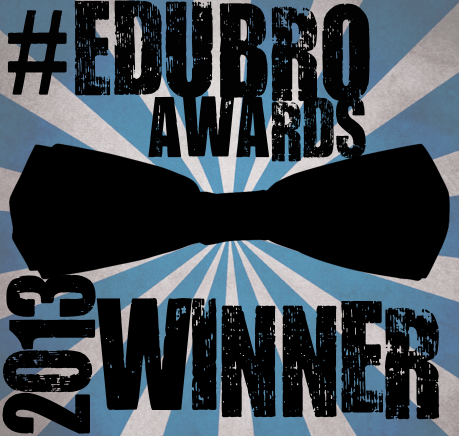 The #BestEdTech Awards for #OETC14 - Check them out! Online voting is now open for the #BestEdTech Awards! All nominations were received from peers and now voting is open to help make these nominees the winner! 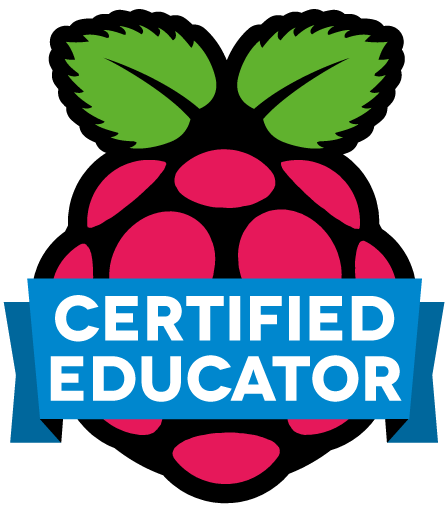 #OETC14 will recognize the work of schools, colleges, programs, teachers, administrators and tech coordinators from around the state through these awards. OETCx is the official un-conference of the Ohio Educational Technology Conference. This participant-driven day-long event offers alternative learning experiences to the traditional conference sessions and creates space for peer-to-peer learning, collaboration and creativity. OETCx mixes new presentation formats, like Ignite-style talks, app smack downs, genius bar and interactive panels with unstructured time for smaller critical conversations to spontaneously occur. Discover more about what OETCx is all about! 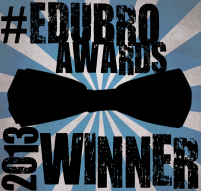 Here are the #EduBroAwards! Enjoy and leave a comment. @bestmscott "Most awesome baby bump award"
@christianlong "Best 'at another airport' tweet"
@dweissmo "best donkey kick in education"
@j_allen "Most likely to make you lol in the comment section award"
Beth Still Most likely to find a really awesome place to stay for ISTE. @joe_bower "Best BS caller award"
@matthewquigley "Best at lassoing children at recess award"
@nancybabbitt "Best baked goods award"
@shellterrell "Never sleeps- especially during online conferences- award"
@Stephen_H "Best use of inspirational quotes on Twitter"
@twilhelmus "Wind Beneath Brett Clark's Wings Award"
All Librarians "Most likely to be the most awesome librarian ever." @ktenkely "kind of a big deal award (with many leather bound books)"
Jabiz Raisdana (@intrepidteacher) Most likely to break out in a Pearl Jam song in class. @michellek107 "has a song for every occasion"
Josh Stumpenhorst (@stumpteacher) Most likely to run out of school. Micheal Doyle (@BHS_Doyle) Most likely to get eaten by a clam in or out of class. Nick and Tim "2 Guys who are having loads of fun while teaching all of us that it's important to laugh at ourselves every once in a while. Steve Dembo BEST Show Host of ALL Time! @mrskmpeters "Amazing scarf collection award"
Todd Bloch @blocht574 Most likely to have a misspelled tweet or a blog post starting with "WHY...."
@russgoerend and @bybmg "Cutest couple in education"
Kristen Williams was one of the coolest people I met when I was in San Francisco in October. She is funny, smart and really good at Spanish. If you want to know how awesome she is, she has been featured on Univision. Something I have been trying to accomplish for a number of years. Kristen is the brains behind and the face in front of the camera. Spanish is your Amigo is her YouTube channel dedicated to teaching people spanish and she is awesome. I have never been very good with language classes in school. I tried German and Spanish and was barely OK with both. Watching a couple of Kristen's videos and I started to remember some of the things I learned over 15 years ago. I was really surprised at how easily it came back to me after only a couple of videos. I love the move to video for language learning. You can see so many options to learn languages and they are very expensive. Here is a Spanish teacher sharing ways to help people learn Spanish for free. 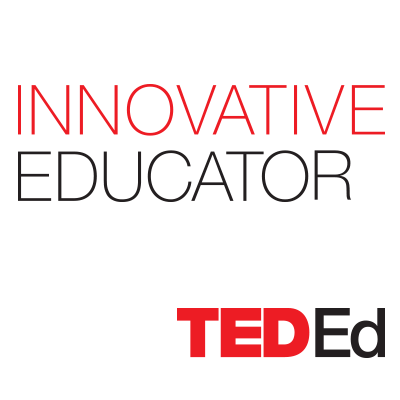 I think YouTube will continue to grow in education as more and more educators embrace it as an instructional tool and not just a place to watch kitten videos. You can check out more videos on her YouTube channel and her website. You can also check her out on Twitter if you want to tweet her about her awesomeness. She is a great new amiga and you should consider sharing her videos with those learning Spanish, those who want to learn Spanish, or those that are helping others learn Spanish. Ron Burgundy needs Spanish is you Amigo.